Photo provided by Ghada Al-Khater. When six Gulf countries unexpectedly imposed a land and sea blockade on Qatar in June 2017, Ghada Al-Khater, 29, felt a plethora of emotions. However, she had no medium through which to convey them. That’s when she picked up her laptop and started making humorous cartoons to let her frustration out, drawing inspiration from the reactions of people around her. Screengrab of Al-Khater's artwork on her Instagram. She started making graphic cartoons, or as she likes to call them, “artoons,” and began posting them on her personal Twitter and Instagram accounts. It had been a while since she graduated from university in 2012, but she now had a reason to use the skills she had learned during her time pursuing a bachelor’s in fine arts degree in graphic design at Virginia Commonwealth University School of the Arts in Qatar. Since her graduation, she has worked in art acquisitions at the Qatar Museums Authority, helping other artists realize their potential. “[She knows] how things got postponed for the museums when the blockade was imposed,” said Aisha Al-Kuwari, Al-Khater’s workmate at QMA, who added that Al-Khater’s job at Qatar Museums has inspired her artistic work. Al-Khater was initially interested in painting, but her university did not offer a major in it at the time. She said she was good at graphic design, but it was not as exciting to her. Through her newly realized passion, however, Al-Khater has ended up using her graphic design skills in a different manner, not the usual logo-making that is attributed to the field. “I like things that raise dialogue, provoke discussion,” she added. Al-Khater’s work is popular on social media. She has more than 4,700 followers on Instagram and her posts receive an average of some 200 likes each. Hamad Al-Fayhani, a student at Northwestern University in Qatar, saw Al-Khater’s work on social media and attended her exhibit at Art 29 at the W Doha. “I really liked how she commented on the political climate with minimalistic yet powerful art. She let her work speak for her and her nation,” he said. Al-Khater, however, does not consider herself famous, but she does acknowledge she has the opportunity to use her art to inspire other people. “I use [social media] as a platform to share my work on, where people are mostly engaging with me on. I did not expect the support, the response, the dialogue, the engagement…I kind of used that as a gateway to do all the cool things I want to do,” she said. Al-Khater struggles with definitions and does not consider herself a cartoonist either because she calls her work illustrations. She uses the word “artoonist” to describe how she thinks her work meshes both artistic purpose and cartoons. However, recently, Al-Khater said she is trying to move away from the political undertones that permeate her work. The Doha Fire Station recently installed an art piece by Al-Khater in the form of a neon outdoor sign in Arabic lettering that translates to “a blessing in disguise.” Although the aim of the art piece is to reference how the blockade has benefitted Qatar in many unexpected ways, she thinks it can mean much more. “It’s a message that can deeply affect anyone who’s going through anything,” she remarked. She also had the chance to create a piece for Qatar Foundation’s Reach Out to Asia initiative, and just a few weeks ago, Al-Khater created a cartoon that explores a social theme for the first time. 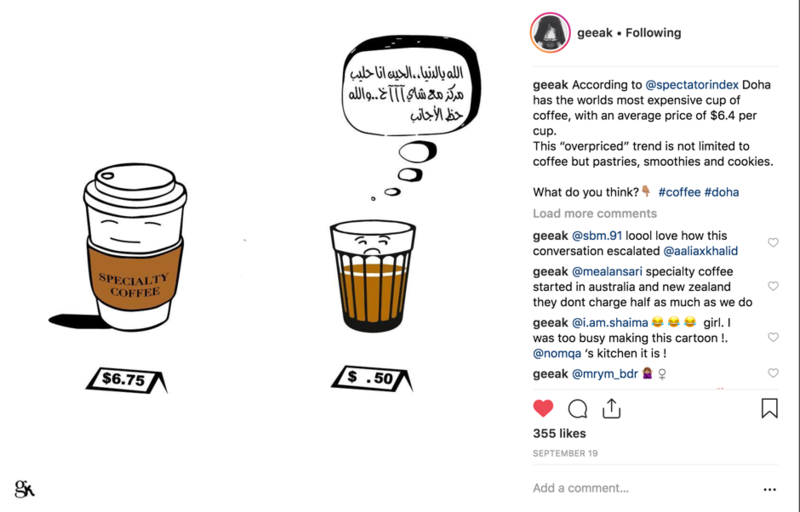 The cartoon shows how Qatar, on average, has the most expensive cup of coffee in the world according to the Spectator Index, yet, according to the artist, the unnecessarily expensive specialty coffee is not as strong or good as normal tea or “karak,” a sweet milk tea popular in the Gulf region. Screengrab of Al-Khater’s artwork on her Instagram. Al-Khater said she doesn’t think being a Qatari woman holds her back. “The fact that I am a woman is driving this even more than I thought. It is a good way to show what girls can do…if I was from any other country [in the Gulf], I wouldn’t be able to do what I do,” she said. But she has received criticism and even abusive messages on social media for her political artwork. According to her, they are “just rude comments” attacking her for mocking the blockading countries. Nevertheless, her family is concerned when she creates something more “naughty” or “cheeky,” like the sarcastic comments and references she makes to shame Saudi Arabia and other blockading countries. Given the current tense political climate in the region, she acknowledges that it is not easy make cartoons that mock other countries’ actions, which could put her security at risk. 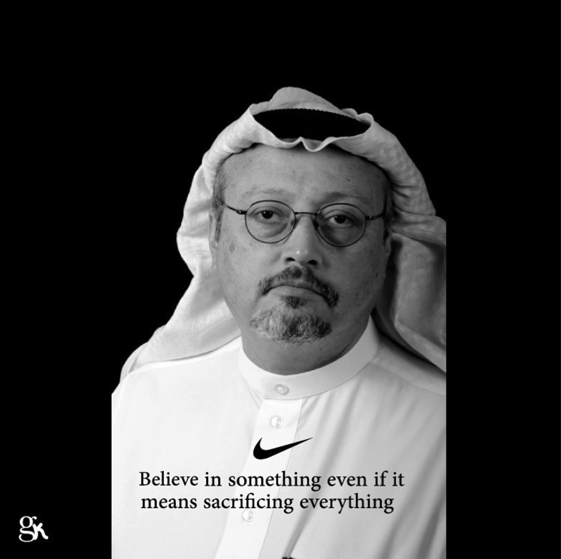 Despite these fears, Al-Khater recently created a piece on Jamal Khashoggi, a Saudi journalist that was killed in the Saudi consulate in Istanbul, that also alludes to Nike’s viral Colin Kaepernick advertisement. Kaepernick faced backlash for kneeling during the U.S. national anthem during his NFL games to protest police violence against African-Americans. Due to his actions, Kaepernick faced massive criticism in the United States, including harsh words from President Trump. In her photo piece, the artist juxtaposes how the football player risked everything he had worked for to convey something he felt strongly about to how Khashoggi lost his life for voicing his opinions. 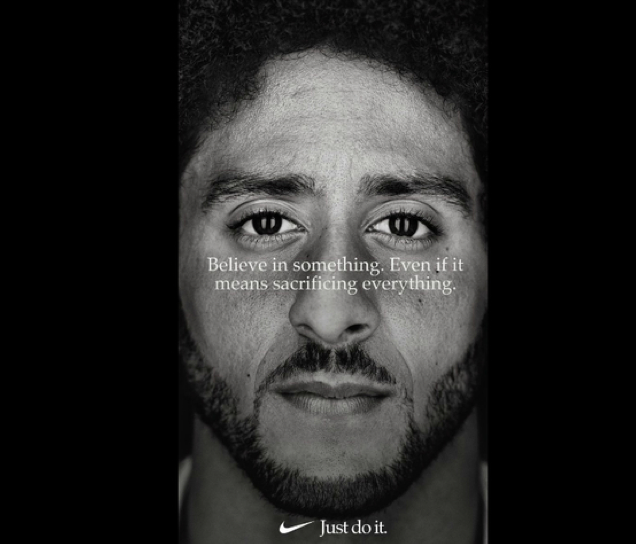 Screengrab of the Nike Colin Kaepernick advertisement. Image from Twitter via Colin Kapernick. 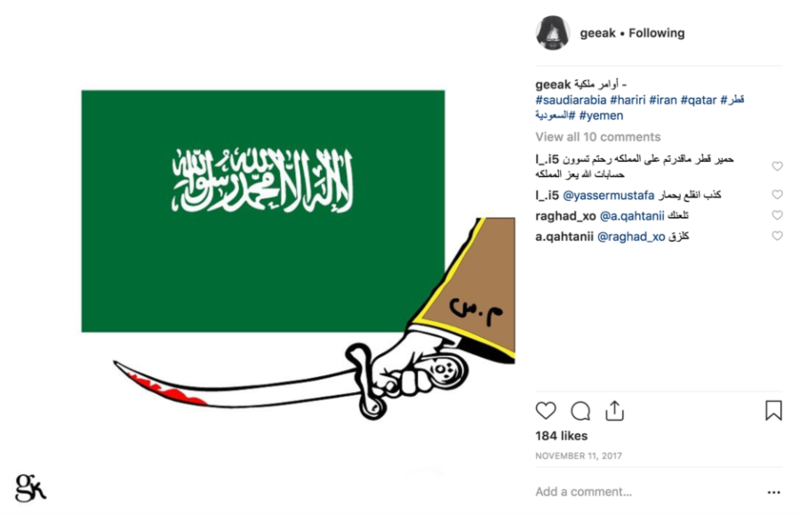 Al-Khater’s artistic statement on the murder of Jamal Khashoggi. Photo provided by Al-Khater. Al-Khater is currently working on two exhibitions, one in Russia as part of the Qatar-Russia 2018 Year of Culture collaboration, which exhibited on Nov. 19, and one in Qatar at the Katara Cultural Village titled [RE]ACTION currently on display until Dec. 31.Moving on, she would like to explore more social topics and possibly spend more time on making merchandise, which she believes is another great platform for her message. “I think art plays a vital role [in society], it can be an initiator for you to learn more about something and that’s exactly what I [am] trying to do,” she added.